The best in barefoot luxury is only steps away. 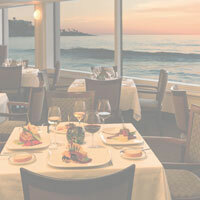 The Marine Room invites you to stay the night at one of San Diego's most treasured beachfront hotels, the acclaimed La Jolla Beach & Tennis Club. Relax on one of the few private beaches in California, with direct access to the sand and surf, minus the crowds. Book a beachfront guestroom and unwind, or stay active with use of the tennis courts, pool, beach activities, massage services, and endless sights to explore. If you are planning a special event or wedding in San Diego, the hotel offers room blocks for out-of-town guests, while our our award-winning restaurant offers an ideal venue for sophisticated celebrations. Start your tradition today. Visit the La Jolla Beach & Tennis Club online to book your stay now. For more information, please call (888) 828.0948.